Liam Jurrah’s guilty plea – to two charges of aggravated assault and two of contravening a domestic violence order – has been delayed till Friday. The matter was listed for today. It again came before Magistrate Daynor Trigg and Mr Jurrah was again represented by Shawanah Tasneem from Central Australian Aboriginal Legal Aid. Ms Tasneem applied for an adjournment till Friday to allow more time for Mr Jurrah’s character references to reach her. 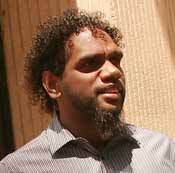 Magistrate Trigg accepted the application without comment, other than in relation to the administrative details.